Explore the Library’s Special Collections with New Online Finding Aids. Ever wonder what kinds of rare and historic materials are preserved in the hundreds of gray boxes housed in Special Collections? Thanks to the teamwork of several library departments, descriptions of more than 100 manuscript collections are now available online. The descriptions, known as finding aids, offer an opportunity for online browsing of significant holdings kept in the boxes that house many collections. The finding aids project, a collaboration among the library’s Special Collections, Cataloging and Digital Initiatives departments, offers an unprecedented amount of online access to the holdings. 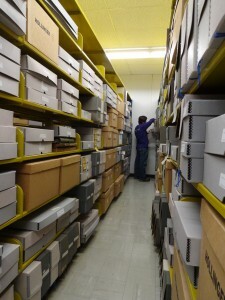 Most of the manuscript collections range from the 1800s to the present. Some highlights include letters written during the Civil War by soldiers from North Carolina; the papers and journals of Horace Kephart, who was instrumental in establishing the Great Smoky Mountains National Park; photographic collections that depict the landscape and people of Western North Carolina in the 19th and early 20th centuries; and letters by George Washington Carver, Walt Whitman and others; and materials documenting the history of WCU. Click on the names tab to see a list of individuals who created or were the source of the collections.